Baby Budget Template? Having a baby should be a joyous, exciting moment in any expectant mother’s life. One of the best ways to make sure that this moment will be great is to be prepared. 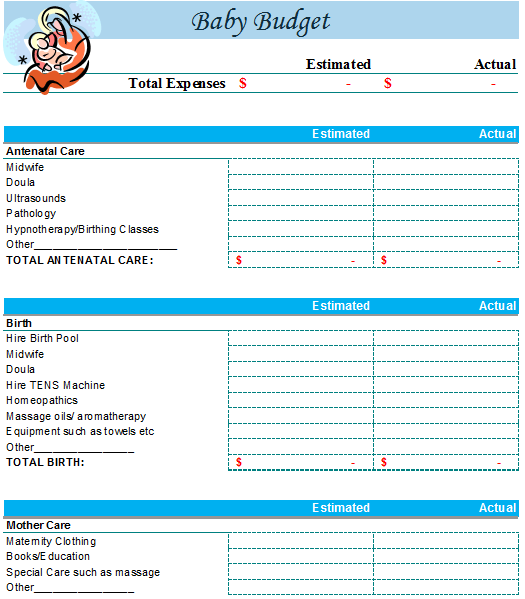 Expectant mothers can be prepared by creating a baby budget for the expenses that come along with pregnancy. This can ease their mind because it was planned for ahead of time and will not be a shock when they arise. Some of the most important expenses that need to be budgeted are those costs for care during your pregnancy (antenatal care). Some typical types of costs include a midwife, Douala, ultrasounds, pathology, and hypnotherapy/birthing classes as well expenses that can be tailored to your preference. The costs that come along with the actual birth should also be included in the budget. Some examples of these costs are: a birthing pool, Douala, midwife, Tens machine, Homeopathic, massage oils/aromatherapy, equipment such as towels, etc. Finally, the mother should include costs that will benefit her during this beautiful moment. Expectant mothers should budget the costs for items such as: maternity clothing, books/education, special care such as massages and anything else that will make them enjoy their pregnancy even more. When you begin to incur the costs listed on the template, you can input this information under actual costs and compare this to what you listed under estimated costs.